I picked up Confrontation during a Humble Bundle sale and just recently played it. There isn’t a lot here that is needed from a keyboard perspective. It is mostly a mouse based game. 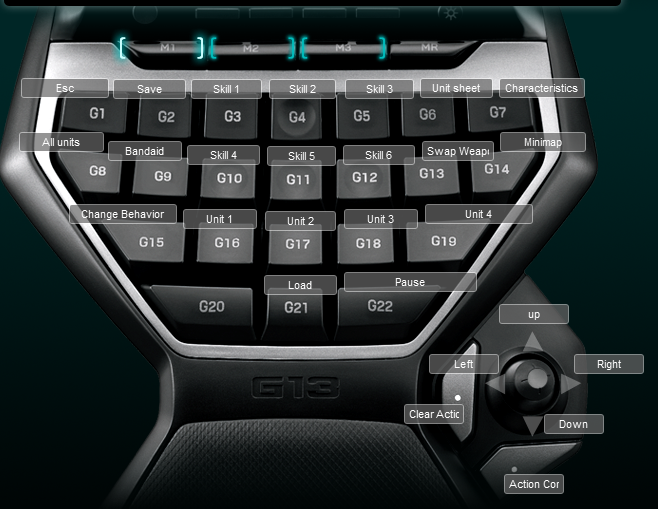 I still created a Logitech G13 profile for the game. I setup the keyboard to focus around the abilities for each user and then saving and quick access to bandaids. I would probably consider redoing the joystick to actually be the unit selection keys instead of camera. I have so far found that I am manipulating the camera via the mouse and not the joystick. Because you can pause this game though I am not sure that character selection matters that much unless you are really going for speed. Below is an image of the keyboard layout.